Muslims beheading innocent infidels looks to be trending world-wide amongst Islamic savages. Acting just as violent and barbaric as Mohammed and his original jihadist crew were 1500 years ago. From the deserts of Iraq and Syria to the streets of London, to Islamists in Algeria beheading French tourists and now across the Atlantic into the States. Monstrous ‘religion of peace’ members are more and more choosing this inhumane way to slaughter infidels whose only crimes were being non-Muslim. How much longer are Muslim apologists and far left communists going to carry on insulting people’s intelligence by saying these animals are not true Muslims or Islam is peaceful and loving. 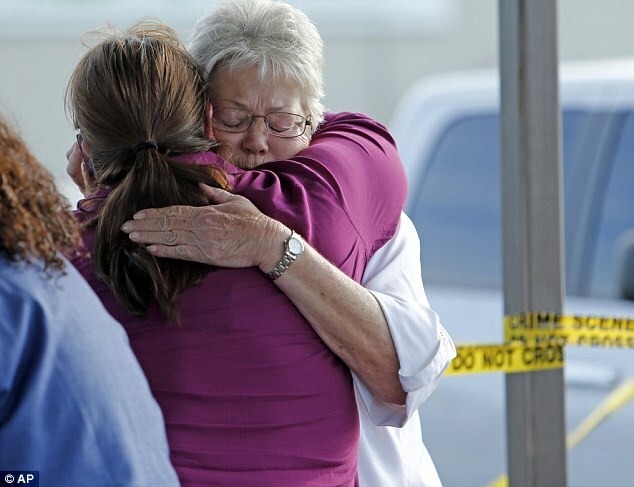 The violent Muslim man suspected of beheading a woman and stabbing another worker at an Oklahoma food processing plant had recently been fired, police said Friday.Alton Alexander Nolen, 30, was sacked from his job at Vaughan Foods processing plant just before the Muslim rage set in and going on the rampage on Thursday afternoon in Moore, Oklahoma, USA. Police have said the man suspected of beheading an innocent woman in her work place was a Muslim convert and had recently tried to convert co-workers to Islam. 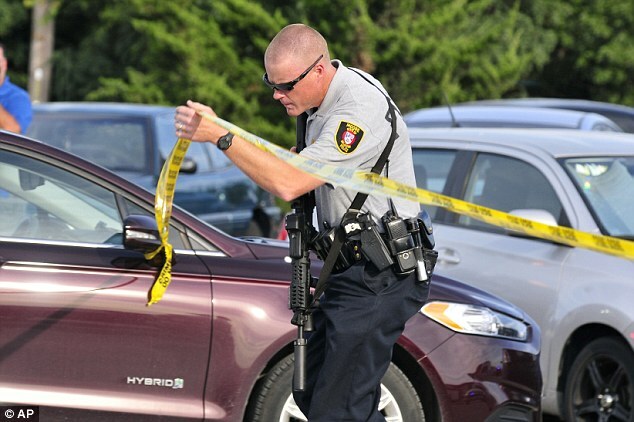 A fired employee who had been trying to convert co-workers to Islam stabbed two female colleagues – beheading one of them – before an off-duty officer shot him, police have said. 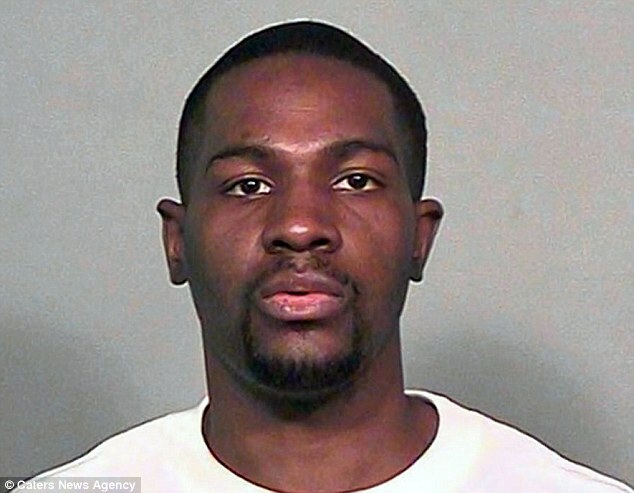 Alton Alexander Nolen, who converted to Islam during a recent stint in prison, was fired from Vaughan Foods, a food processing plant in Moore, Oklahoma, on Thursday before returning to his SUV and smashing it into another vehicle. The 30-year-old then climbed out and entered the building, attacking the first two people he saw with a knife he had used at the plant, Moore Police Sergeant Jeremy Lewis said. After beheading Colleen Hufford, 54, and stabbing Traci Johnson, 43, Nolen was shot and wounded by off-duty sheriff’s deputy and company CEO Mark Vaughan. Nolen survived and was hospitalized. Johnson is in stable condition in hospital. The FBI is now investigating Nolen’s recent conversion to Islam to determine whether it was connected to the attack. The bureau will work in conjunction with the Moore Police Department to chart Nolen’s background as his motives are still unclear, Fox News reported. 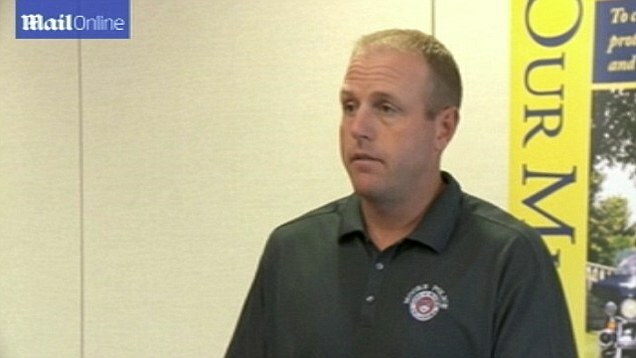 Authorities applauded Vaughan, an Oklahoma County reserve deputy, for his quick-thinking. 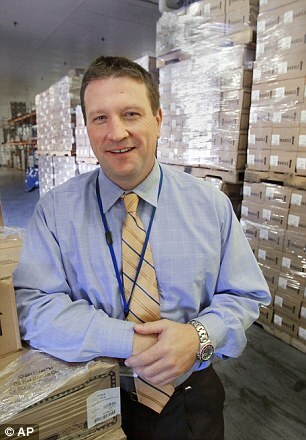 He owned Vaughan Foods until it was acquired by Reser’s Foods in 2011. 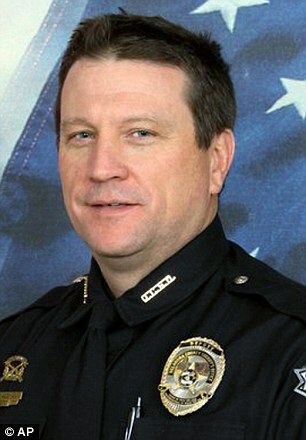 Sheriff John Whetsel with the Oklahoma County Sheriff’s Office added in a statement: ‘These were heinous criminal acts that were ended by the quick response of Oklahoma County Reserve Deputy Sheriff Mark Vaughan. ‘I am extremely proud of the actions of Deputy Vaughan and I am convinced those actions saved the lives of several other employees. ‘Mr. 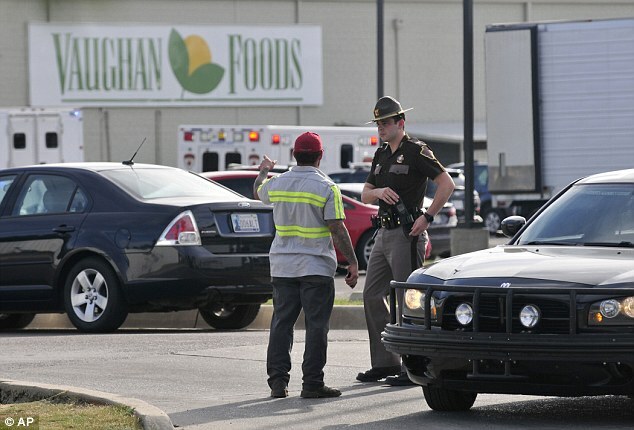 Vaughan, who serves as CEO of Vaughan Foods, was at work and when he was alerted that a man was attacking employees with a knife, Mark didn’t hesitate. He quickly responded. ‘Mark put an end to the threat by shooting the suspect and saving the life of a second victim who was being actively attacked by the suspect. Sergeant Lewis, who said he does not know why Nolen was fired, added that police are waiting until he was conscious before they move forward with charges. On Friday, Lewis said that Nolen had been trying to convert co-workers to Islam and that local police had contacted the FBI to help investigate the man’s background, KFOR reported. 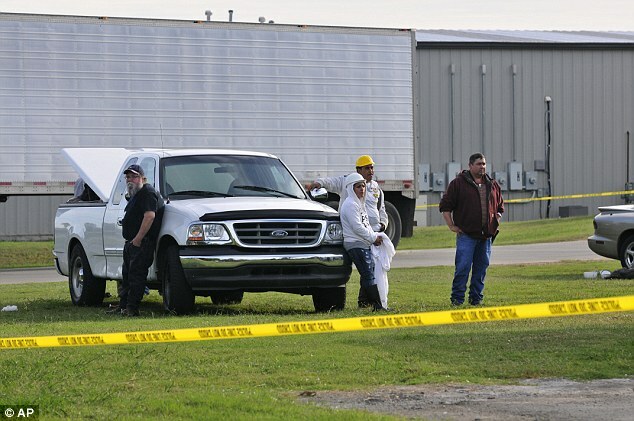 Co-workers said Nolen himself had only just converted to Islam, according to News9. It is not yet known if his beliefs played a role in the attack. Announcing the FBI’s involvement in the case, police released a statement saying: ‘After conducting interviews with Nolen’s co-workers, information was obtained that he recently started trying to convert several employees to the Muslim religion. Records show Nolen has a long previous criminal record including assault and battery on an officer, possession of a controlled substance and possession of cocaine with the intent to distribute. In 2010 he was charged with assault and battery of a police officer after being pulled over for having a fake license plate. He was discovered to be driving with a suspended license and when the officer tried to cuff him he pushed him hard in the chest and bolted. Records show Nolen has a long criminal record. In 2006 he was charged with possession of cocaine with intent to distribute. He was only convicted in April 2011 when he pleaded guilty and was sentenced to six years with credit for time served to run concurrent with later sentences. 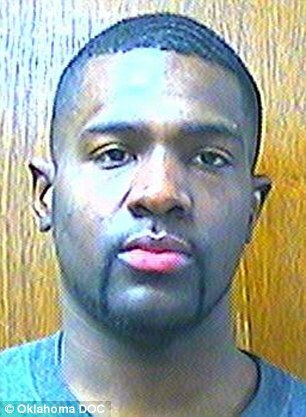 In 2009 he was arrested after an anonymous tip that he was dealing drugs out of his sister, Paige’s, apartment at the Langston University Commons complex. He pleaded guilty to possession of marijuana, obstructing an officer and resisting an officer. He was sentenced to five years deferred sentence, fined $1,200 and sentenced to 40 hours community service as well as agreeing to attend drug court. He was repeatedly sanctioned by drug court for failing to stay clean and spent three days in jail the following May and four consecutive weekends in June 2010. Then in 2010 he was charged with assault and battery of a police officer after being pulled over for having a fake license plate. He was discovered to be driving with a suspended license and when the officer tried to cuff him he pushed him hard in the chest and bolted. As part of his sentence – five years with all but the first two suspended – he was ordered to attend an anger management course. He was last released from jail in March 2013, according to records. As part of his sentence – five years with all but the first two suspended – he was ordered to attend an anger management course. He was last released from jail in March 2013, according to records. Records also reveal he has a tattoo of Jesus on his chest and praying hands on his arm. He also has ‘Assalamu Alaikum’ – a greeting often used by Muslims meaning ‘may peace be on you’ – on his abdomen. On Friday, 911 calls revealed the panic after he entered the building on Thursday afternoon. ‘They’re in the office, front office of the building. Yeah, we can hear a lot of screaming,’ the caller tells the dispatcher. 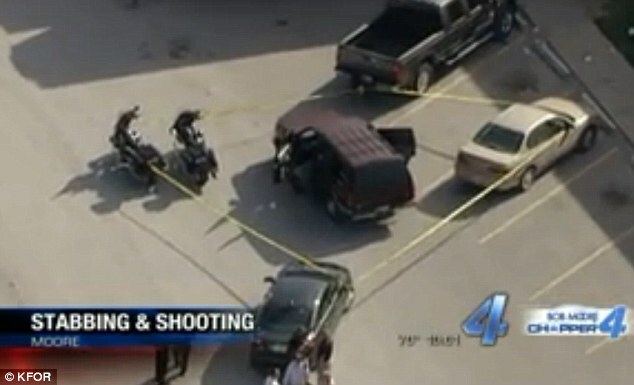 The suspect can be heard running and then three gun shots are heard, KFOR reported. ‘Stay down! Stay down!’ the caller tells his fellow employees. Lewis confirmed to KFOR that the type of knife he allegedly used in the attack was the same kind used at the plant. Nolen had worked as a production line employee. He added that the suspect and the victims were apparently not involved with each other outside of their work at the business. ‘The victims had no relationship to the suspect. He is just an angry employee that acted out,’ Lewis said. Police had been called to the store around 4.15pm following a report about a fight inside Vaughan Foods. While en route, officers were told that there had been a shooting, Lewis said. 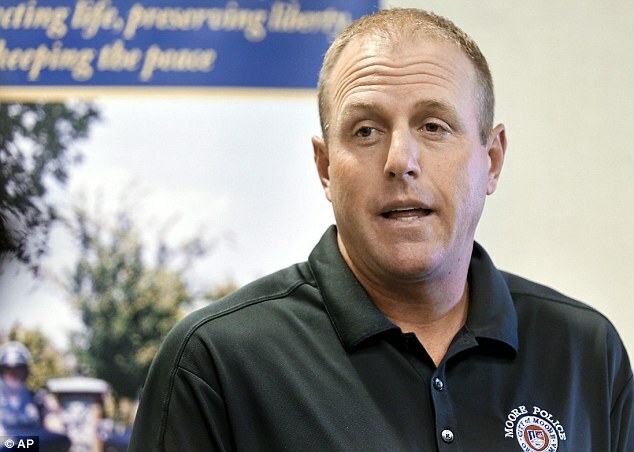 ‘When officers arrived they approached the business as an active shooter situation. Once they entered the business they found a female deceased of stab wounds and they had a male with multiple gunshot wounds,’ Lewis said. 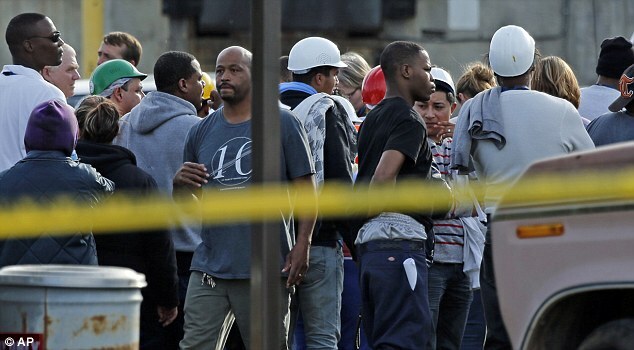 He said the building was evacuated and searched and no other danger was found. Employees returned to work on Friday. It added that it will provide support and counselling for those affected. This video shows the true barbaric,twisted and inhumane nature of the Taliban forces. First two Taliban members show off the heads of four dead policeman which have been chopped off to the camera and on floor. The pair of savages then pick up the severed heads, one in each hand waving them about to the camera like they are some kind of trophy with stupid grins on their faces. The next shot from a wider angle shows several of the inbred Muslim fundamentalists outside in what looks like their base judging by the amount of weapons lying about. The bearded filth then begin having a kick around using the heads of the dead men. One of the the sick savages even tries showing off his dribbling skills with one of the heads. When they have had their fun they disposed of the heads into some overgrowth. The greatest leader Britain has ever had Sir Winston Churchill, during his lifetime compared “Islam inside a man to a dog with rabies.” How right he was. It goes without saying that whenever there is some kind of inhumane violent act taking place or being planned, there is almost always a bearded Muslim savage central to events. 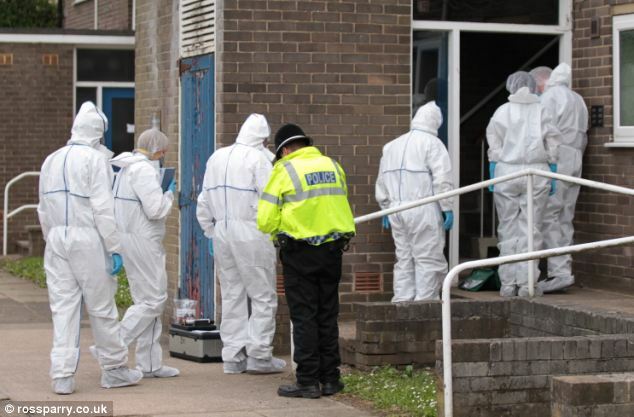 This beheading of an 18 year old female in Sheffield is no different. A 20-year-old man has appeared in court charged with the murder of a young woman who was beheaded in a knife attack. 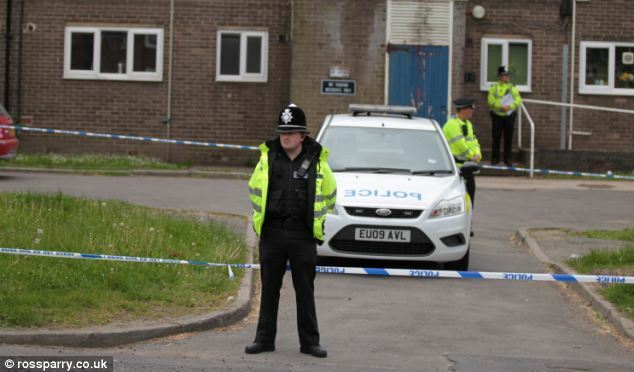 Aras Hussein appeared at Sheffield Magistrates’ Court today accused of murdering Reema Ramzan, 18. Miss Ramzan, who was from the Darnall area of Sheffield, died on June 4 following an incident at a property on Herries Road, in the city. Detectives said she suffered a severe knife attack resulting in fatal injuries, including the severing of her head. Hussein, of Sheffield, is also charged with assaulting five people at Sheffield’s Northern General Hospital, where he was taken following his arrest by police. He stood in the glass-fronted dock today flanked by two uniformed police officers. Sporting full beard and short, dark hair, he wore a navy blue T-shirt and spoke only to confirm his personal details and that he understood the charge. Hussein was remanded in custody following a 10 minute hearing and told he will appear again a Sheffield Crown Court on Thursday. Miss Ramzan’s family issued a statement through police today. 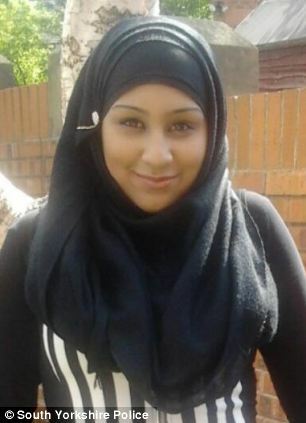 It said: ‘Following the death of Reema, a loving and caring daughter and sister, we as a family would like to pass on our heartfelt thanks for all of the messages and support we have received from our extended family, friends, people in the community where we live and especially from the staff and students at Sheffield College. ‘These messages and support have given us strength and helped us to try to deal with the nightmare we have found ourselves in. Barbaric Muslim savagery in the streets of London after soldier is beheaded. News now reporting it was Muslim attackers shouting Allahu Akbar as they gloated in butchering the injured soldier. More to follow…..
Senior Whitehall sources have told the BBC that the Woolwich attackers are thought to have tried to film their attack whilst shouting “Allahu Akbar” – God is Great, says political editor Nick Robinson. 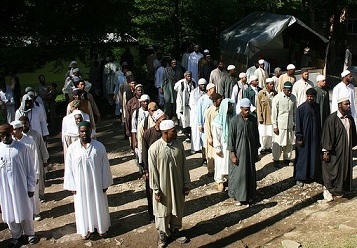 The men were said to have been of Muslim appearance. The Prime Minister is expected to speak to the Home Secretary at 18:15 BST from a train to Paris about what is now being treated by government as a suspected terrorist attack, Mr Robinson says. Met Police Commander Simon Letchford confirms officers shot two men at the scene. He said he believed “from early reports” that both men were carrying weapons. Numerous pictures have been taken by witnesses and others who arrived on the scene after the incident. Senior aides to Mayor of London Boris Johnson describe the Woolwich killing as a ‘sickening deluded deranged act of violence’, says the BBC’s Robin Brant. 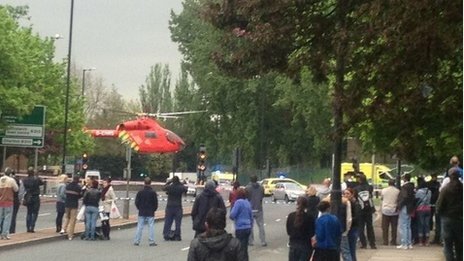 Witness Graham Wilders told the BBC he arrived on the scene to find a car crashed into a wall and a man on the ground. “Two people were lying over him and I thought they were trying to resuscitate him,” he said. But Mr Wilders said he drove on to park his car, and when he returned another witness told him the two men were stabbing the man on the ground. 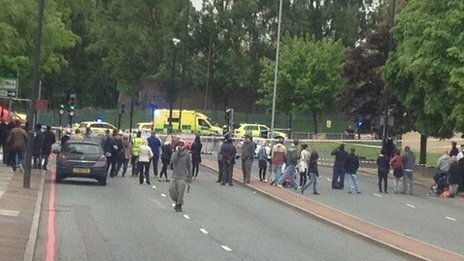 Police, who have given little information so far, say they will issue an official statement between 17:30 BST and 18:00 BST. Sources tell the BBC’s James Landale Mrs May has also spoken to the Metropolitan Police Commissioner, Bernard Hogan-Howe, and the head of MI5, asking to be updated on the incident. The Home Secretary Theresa May summons a meeting of Cobra, the government’s emergency response committee in Whitehall, to assess the incident in Woolwich. The Ministry of Defence said it was urgently looking at the reports that the incident involved a soldier, but had no further comment. London Mayor Boris Johnson says his thoughts are with the victims’ families. Ministry of Defence cannot confirm that a serving soldier died in the Woolwich attack. One witness, identified only as James, said two men attacked another man, aged about 20, who was wearing a Help for Heroes T-shirt. “These two guys were crazed. They were just animals. They dragged him from the pavement and dumped his body in the middle of the road and left his body there,” he told LBC radio. Police say they are not looking for anyone else in relation to the incident in Woolwich. Mr Raynsford says police have removed a “substantial number of weapons” from the scene, including knives and at least one firearm.